After the Houston Rockets’ best season in nearly 20 years, David Weiner breaks down their cap situation to keep their own free agents and improve the team. 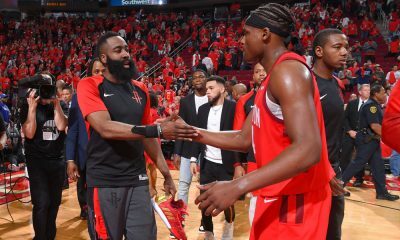 The Houston Rockets just completed their most successful season in 18 years, advancing to the Western Conference Finals despite numerous injuries to key players throughout the season (including injuries to Patrick Beverley and Donatas Motiejunas that kept them out for the entire playoff run). While many fans still have a bad taste in their mouths from a 4-1 series loss to the Golden State Warriors, the vast majority still seem to have (what I believe to be) the proper perspective on the overall success of this season’s campaign. With the Rockets’ season now ended, it’s time to once again take a look at the team’s salary cap situation and where the Rockets can go from here. 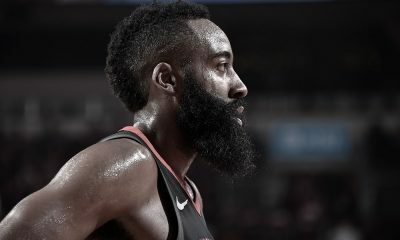 Player salary commitments: Dwight Howard ($22.36 million), James Harden ($15.76 million), Trevor Ariza ($8.19 million), Kostas Papanikolaou ($4.8 million, non-guaranteed), Terrence Jones ($2.49 million), Motiejunas ($2.29 million), Pablo Prigioni ($1.73 million, partially guaranteed for only $440,000), Clint Capela ($1.24 million), Joey Dorsey ($1,015,421) and Nick Johnson ($845,059). Cap holds: Jason Terry ($8.76 million – Rockets hold full Bird rights), Corey Brewer ($6.11 million – Rockets hold Early Bird rights), Beverley ($2.725 million – Rockets hold full Bird rights), Josh Smith ($2.49 million – Rockets have only Non-Bird rights), the rookie scale slot for the #18 pick in the 2015 NBA Draft ($1.37 million), and K.J. McDaniels ($1.05 million – Rockets have only Non-Bird rights). Given these salary commitments and exceptions, and based on the currently projected 2015-16 salary cap of $67.1 million, the most cap room the Rockets could create (barring trades . . . yeah, I know) is about $10.37 million. However, this would involve renouncing rights to all free agents, waiving Papanikolaou and Prigioni and renouncing/trading away their first round pick. Since the Rockets are now at a level (title contention) where roster continuity is more important, do not expect them to opt for cap room . . . unless a star-caliber player shakes loose and opening up additional cap room is the only way to obtain that player. So the most likely scenario is that the Rockets will operate over the cap this summer. 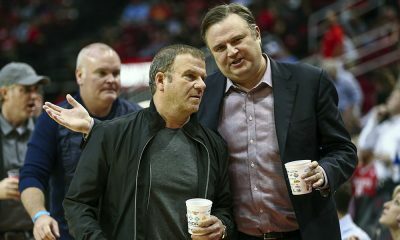 As the Rockets prepare for the NBA Draft and the subsequent free agent season, there will be some internal cap-maneuvering for GM Daryl Morey and his staff to do. The most likely such maneuver will be for the Rockets to pick up the $4.8 million team option on Papanikolaou’s contract. This option year is fully non-guaranteed, so there is no financial commitment attached to exercising the option. Also, exercising the option is necessary in order for Papanikolaou to be trade-eligible. As a sizable non-guaranteed contract, Papanikolaou will probably be a crucial component to almost any trade of significance the Rockets attempt to pull off this summer. I would be shocked if Kostas’s option were not picked up on or prior to draft day. Houston will also likely extend qualifying offers to Beverley ($2.725 million, more than he’d otherwise receive based on his prior salary due to meeting the CBA’s “starter criteria”) and to McDaniels ($1.05 million, which is the one-year veteran’s minimum plus $200,000) in order to make them both restricted free agents and to give the Rockets the ability to match any offers from other teams. Expect the Rockets to ramp up their years-long courtship of 2009 second round pick Sergio Llull, a 6-3 combo guard who has developed into one of the top guards in Europe. After helping lead Real Madrid to a EuroLeague title, there is little else Llull can accomplish overseas. While being a star on a perennial title contender in his home country (as well as a prohibitive contract buyout) has thus far kept Llull from making the leap to the NBA, he has reportedly always had interest in eventually coming over. With a title now in hand (and his buyout amount allegedly now low enough), now seems like the ideal time for the 27-year-old guard to join the Rockets. He will likely command most/all of the MLE, so the Rockets will need to prioritize such a signing with their other offseason moves. But hearing head coach Kevin McHale (in an interview with 790 AM’s Charlie Pallilo) recently, it sounds like signing Llull will be a high priority for this team. The Rockets will enter the 2015 NBA Draft armed with the 18th and 32nd picks, about $800,000 in remaining cash to spend, as well as an assortment of young players, draft rights and future picks to trade. 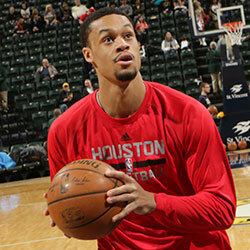 Knowing Morey, expect Houston to diligently seek out a draft night deal. Whether that is an attempt to trade up in the draft or a shot at acquiring an established point guard (such as Kyle Lowry or Ty Lawson) remains to be seen. Unlike trades consummated after the July Moratorium, draft day trades (as in, those trades actually consummated before July 1) are made using this current season’s cap figures. With the Rockets only about $2-3 million below the luxury tax threshold this season, any large draft day trades they make will probably subject them to the “taxpayer matching rules” (in which a team that will be over the tax threshold following a trade may not take back more than 125% of outgoing salary plus $100,000). Therefore, we may see the Rockets agree to terms on a trade during the draft but not have it consummated until some time in July (when the cap figures reset, certain outgoing players’ salaries increase, and the team can possibly drop far enough below the tax threshold to work under more favorable salary matching rules). The more likely scenario (as is always the case) is that the Rockets are unable to pull off a significant draft day trade. 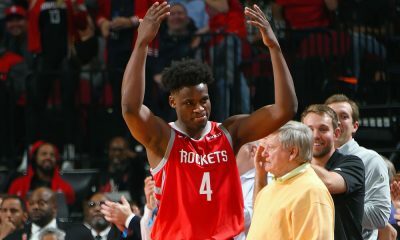 We may instead see Rockets owner Leslie Alexander once again allow Morey to spend his remaining $800,000 cash allotment this season on a late second round pick to stash overseas (as the team has done in recent years with Furkan Aldemir and Alessandro Gentile). The Rockets have several key decisions to make regarding their own free agents that could greatly impact what they do about any outside additions to the roster. In his interview with Pallilo, McHale made it quite clear that retaining most/all of their free agents was a high priority for the Rockets. Patrick Beverley: While Beverley’s relatively low cap hold could possibly help the Rockets make other maneuvers before re-signing him, don’t expect Beverley to be overly generous in his contract demands. Despite his injury history, expect his agent to cite (repeatedly) Beverley’s honor as an NBA All-Defense Second Teamer in 2013-14 and to look for a deal in the range of what Boston defensive guard Avery Bradley received last summer (4 years, $32 million). That might be a tad rich for Houston, especially if they hope to muster any meaningful cap room in the summer of 2016. However, if Beverley is willing to sign for less in order to retain a starting spot on a contender, there is still a decent chance that he’ll be back next season. 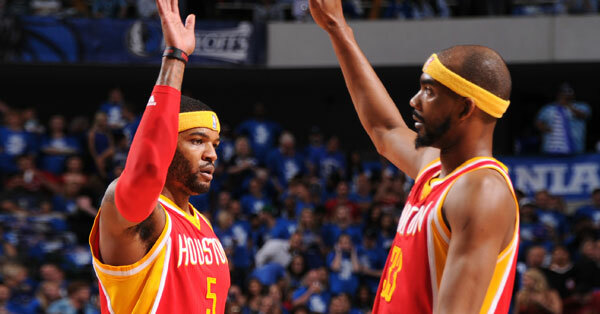 Corey Brewer: After waiving his player option as a condition to his trade to Houston last December (an option that he undoubtedly would not have exercised anyway based on his late season performance), Brewer will become an unrestricted free agent on July 1. The Rockets hold Early Bird rights to Brewer, which means that they can offer him a deal starting as high as about $8.23 million. As it is unlikely that Brewer will do better than that (or even get that high an offer from the Rockets), Houston should be able to exceed the cap in order to retain Brewer if the sides can agree on a deal. While Brewer’s high motor is a huge plus for this team, the Rockets will need to weigh his strengths against his weaknesses (poor 3-point shooting and a tendency to overplay too much on defense) when deciding how much to offer him. Josh Smith: I wrote in my last cap update about the details surrounding Smith’s free agency and how much the Rockets could offer him. Essentially, Houston must either hope that Smith accepts its Non-Bird free agent tender ($2.49 million) or use the MLE (or cap room) to re-sign Smith. While Smith would still clear over $7 million in total salary next season between a Non-Bird tender from Houston and his stretch payment from the Detroit Pistons, he can always make more with a larger new contract. It seems the Rockets are hoping they can leverage Smith’s happiness in Houston to convince him to stay for the Non-Bird amount. Only time will tell if that strategy will work. Jason Terry: Coming off an MLE-sized contract he signed with the Boston Celtics in 2012, do not expect Terry to re-sign for anything close to that much this summer. But the Rockets apparently love what Terry brings to the table, both on and off the court. As has been mentioned on this site, look for the Rockets to offer Terry a deal similar to what they gave Francisco Garcia a couple of years back: either a two-year veteran’s minimum deal (with a player option on Year 2) or a one-year vet minimum deal (perhaps with a tacit understanding about an ongoing role with the team). K.J. McDaniels: The decision with McDaniels will likely be one of the hardest decisions of the offseason for Houston. A young player with high upside, there will certainly be several teams that come calling for McDaniels’s services. But the Rockets are limited to either their qualifying offer ($1.05 million) or tapping into the MLE (or cap room) to re-sign K.J. (As an “Arenas Rule” free agent, no team can offer McDaniels a starting salary in excess of the full Non-Taxpayer MLE; but teams could still create the sort of “poison pill” offer sheets Houston utilized to sign Jeremy Lin and Omer Asik.) The Rockets traded for McDaniels in February largely to reserve another palatable alternative for themselves this summer should Brewer leave or should Ariza be traded. But if Ariza and Brewer are both Rockets next season — and especially if Llull comes over as an MLE signing — it is likely that McDaniels moves on to another team. If the Rockets can somehow convince McDaniels to accept the qualifying offer (with the hopes of signing a larger contract next summer), it would be quite the coup for Morey and his staff. 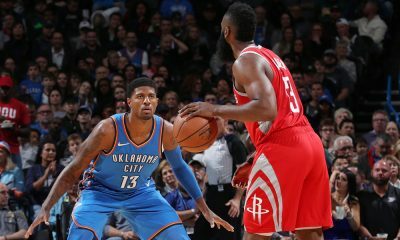 After a terrific playoff run to the Western Conference Finals, the Rockets must now turn their attention to both retaining the talent that got them there as well as adding to that talent via trades and free agency. Morey and company have enough assets to at least make legitimate trade offers this summer for a “third best player” or other key piece. Even if no outside talent is added, bringing back this season’s entire (healthy) rotation, with the additions of Llull and a mid-first rounder, could possibly be enough to get Houston over the hump next season. But if we’ve learned anything from the last several years, it’s that the Houston Rockets will explore every possible avenue to get better.